Last month my family and I enjoyed a brunch cruise in San Diego to celebrate my mom's birthday. It was so much fun and the kids LOVED it! I think that we are ready for another adventure on the water! This time: Whale Watching! Have you ever been whale watching? Newport Landing Whale Watching has served southern California for 30 years providing whale watching and dolphin cruises. Year around cruises view many varieties of whales including the giant blue whale which is over 80 feet in length (during the summer and fall months), finback whales, grey whales (winter and spring months), minke whales, humpback whales, several types of dolphin (including giant Rizzo dolphin over 14 feet in length), seals, and all sorts of other marine life. Each cruise is a unique experience; you never know what you might encounter. Newport Landing is located in Newport Bay, Newport Beach and only minutes from most of Southern California. Whale watching in Dana Point and Long Beach. With a 96% success rate viewing whales and/or dolphin almost every trip has viewing opportunities for these mammals. Whether for an individual or for a larger group looking to join one of the general admission whale watching cruises, Newport Landing Whale Watching takes great pride in sharing the magical experience of our whale and dolphin cruises. 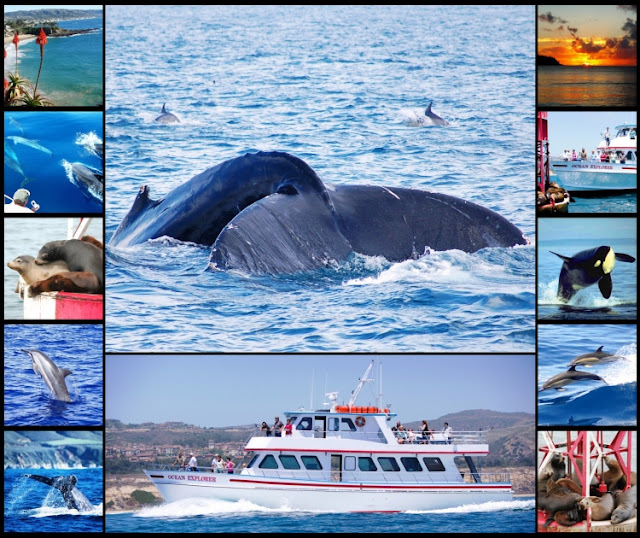 Newport Landing Whale Watching - $15 Whale Watching cruise special: OFFER details. Disclosure: I have partnered with USA Family Guide and Newport Landing Whale Watching to share details about Newport Whale Watching and their special offer. I did not receive compensation but will receive a cruise in exchange for sharing this post. Whao..so cool to be able to go whale watching and get so up and close with these big creatures. It must have been a very interesting experience for you and family. That must have been sooooo cool! I´ve seen whales in acquariums but never live! Boy my kiddos would sure love that! I've always wanted to go whale watching! Looks like you had great fun! I love Whale Watching, one of my favorite Whale Watching was in Boston, such a fun family activity! Great pictures!